It is well known that disturbances exist in most practical controlled processes due to friction, load variation, measurement noises, sensor errors, actuator errors and so on. Hence, it becomes a crucial problem that how to disturbance rejection and guarantee stability for control systems [126, 127]. In , composite anti-disturbance control problems have been investigated for a class of nonlinear systems with Markov jump parameters and multiple disturbances. A Lyapunov stability approach has been applied to analysis and design of disturbance observers and anti-disturbance controllers. In , an analysis and design method for both closed-loop stability and disturbance rejection has been given. 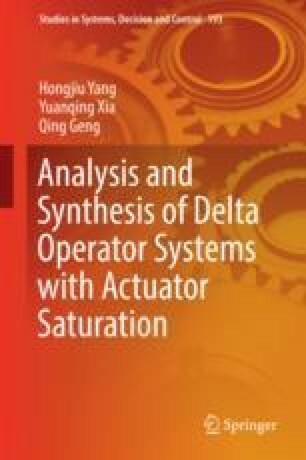 For linear exponentially unstable systems subject to actuator saturation and input disturbances, semi-global practical stabilization has been obtained in . Stabilization of a fault detection error system has been discussed with a piecewise Lyapunov function . Moreover, effect of disturbances has been reduced by tuning parameters of control laws such that any trajectory of systems converges to an arbitrarily small neighborhood of origin . Furthermore, controller design-induced L2 disturbance attenuation has been investigated for T-S fuzzy DOSs with time-varying delays via an input-output approach in . Problems on practical stabilization of DOSs subject to actuator saturation and disturbances are important and challenging in both theory and practice, which motivated us to carry on this chapter.